Notorious woman of affairs ... Adventurous man of the world! One of Alfred Hitchcock's classics, this romantic thriller features a cast to kill for: Ingrid Bergman, Cary Grant, and Claude Rains. Bergman plays the daughter of a disgraced father who is recruited by American agents to infiltrate a post-World War II spy ring in Brazil. Her control agent is Grant, who treats her with disdain while developing a deep romantic bond with her. Her assignment: to marry the suspected head of the ring (Rains) and get the goods on everyone involved. Danger, deceit, betrayal - and, yes, romance - all come together in a nearly perfect blend as the film builds to a terrific (and surprising) climax. Grant and Bergman rarely have been better. In 1946’s Notorious, Alfred Hitchcock reunites with two of his most successful collaborators, Ingrid Bergman and Cary Grant – both of whom worked together for the first time on this thriller. John Huberman (Fred Nurney) gets convicted for treason as a German spy. Rather than sit through 20 years of prison, he kills himself. During and after the trial, his daughter Alicia (Bergman) opted for boozing and risky behaviors to distract herself from her personal woes. At a party, she meets and seduces the mysterious TR Devlin (Grant), a man who turns out to be a government agent. Devlin recruits Alicia to fly to Brazil and ingratiate herself with her dad’s former cronies so she can report their plans. While she and Devlin fall for each other, she must pretend to go for an old acquaintance – and Nazi sympathizer – Alexander Sebastian (Claude Rains). Various complications ensue. Though both Bergman and Grant worked with Hitchcock a few times – separately, except for Notorious - I think Grant’s collaborations proved to be much more successful. 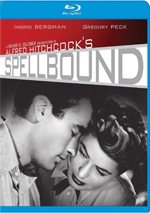 Bergman only made three flicks with Hitchcock: Notorious, 1949’s Under Capricorn and 1945’s Spellbound. I never saw Capricorn but thought Spellbound stood as lackluster Hitchcock. On the other hand, Grant starred under Hitchcock four times, a list that includes at least one true classic: 1959’s North By Northwest. 1955’s To Catch a Thief is also pretty good, while 1941’s Suspicion comes in the same “flawed/mediocre” category as Spellbound. Where does Notorious land on this list? Fairly low, I’m afraid, as I think it provides semi-forgettable Hitchcock. I’m glad it loses the tedious psychobabble of Spellbound, but it fails to boast that movie’s stronger elements. While Spellbound had its flaws, at least it came with an intriguing narrative that unraveled in a compelling manner. On the other hand, Notorious starts slowly and never quite recovers. Much of the problem stems from the bland characters. While they should come across as lively, they don’t, perhaps due to miscasting. Bergman is too regal and classy for “party girl” Alicia; she should seem like a loose cannon to some degree, but Bergman couldn’t pull off rebellious and rambunctious if her life depended on it. Even with more appropriate casting, Notorious would probably seem mediocre, mostly because of the lackluster plot. The story launches slowly and never really recovers, as its story remains too vague for it to sizzle. Granted, I suspect that the spy plot essentially exists as one of Hitchcock’s beloved MacGuffins. To a large degree, I believe the story comes into place for little reason other than to create character moments and the romantic triangle among Alicia, Devlin and Sebastian. And that would be fine, if we just cared more about those roles and what happens to them. Maybe others do enjoy that thread more than I do, but I just can’t invest much interest in their actions, and that’s a fatal flaw. When you’re disinterested in characters, you find it tough to experience tension when they're put in harm’s way. Despite all my criticisms, Notorious isn’t a bad film, and it percolates better during its third act. I still regard it as average Hitchcock, however, as it comes with too many obstacles to turn into a true success. Many view Notorious as a Hitchcock classic, but I must admit it does little for me. 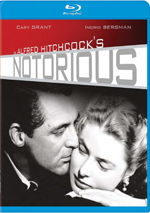 Notorious appears in an aspect ratio of approximately 1.33:1 on this Blu-Ray Disc. 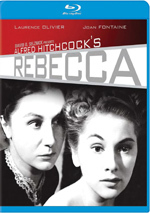 Though the “newest” of the three Hitchcock Blu-rays that debuted on the same day – with 1940’s Rebecca and 1945’s Spellbound - Notorious offered the weakest visual presentation. That didn’t make it a poor transfer, though; it just seemed less consistent than the other two. The biggest negative change revolved around print flaws. I noticed examples of specks, marks, streaks and blotches. While these weren’t heavy, they appeared more often than I’d like – especially based on the clean visuals seen during the other two Hitchcock Blu-rays. Sharpness was also erratic but still good most of the time. Occasional shots came across as a bit soft and smeared; in particular, early images of Alicia at a party looked iffy, and a few other elements lacked great delineation. Most of the flick provided positive accuracy, though, so overall definition was fine. I noticed no issues with jaggies or shimmering, and edge haloes were absent. Blacks tended to be dark and tight, and shadows were positive. On occasion, contrast was a bit off, and the movie could seem too bright – again, that early party scene was an issue. Nonetheless, the film usually boasted the expected silvery sheen. Ultimately, Notorious looked decent to good for its age, but it wasn’t nearly as appealing as its “release mates”. Similar thoughts greeted the acceptable but unexceptional monaural soundtrack of Notorious. This was a pretty average mix for its age. Speech was intelligible and clear; lines could be thin and a little edgy but usually appeared fine. Music seemed slightly shrill but gave us acceptable clarity most of the time, and effects were similarly decent; those elements didn’t offer much heft, but they were clean enough. A little background noise appeared at times, but most of the film passed without distractions. I thought this ended up as a “C+” track for its era. We discover a pretty stacked set of supplements here, and these open with two separate audio commentaries. The first features film professor Rick Jewell as he offers a running chat – but not one that could be called “screen-specific”, as Jewell provides what he refers to as a “contextual commentary”. This means he leads us through a lot of background, as he covers the history of RKO Studios, notes about cast and crew, social subtext related to the film’s era and similar topics. All of this adds up to an informative piece. Jewell goes down a logical, prepared path and stays on target from start to finish. Some may dislike the absence of scene-specific material or interpretive references to the film, but the second track should cover those. In this one, Jewell does all the historical “heavy lifting” for a brisk and informative piece. For the second commentary, we hear from film professor Drew Casper. He provides his own running, screen-specific take on themes and interpretation, characters and story, cinematic techniques, and some cast/crew/production notes. I’m glad that Casper’s commentary contrasts with Jewell’s and takes on a more interpretive bent, but unfortunately, it’s not very good. The track moves slowly and seems more concerned with declarations of Hitchcock’s greatness than anything else. By the end, Casper runs out of material and just starts to tell us what other Hitchcock movies he loves. (All of them, apparently.) This commentary offers some merit, but it’s generally plodding and less than enjoyable. For a third audio option, we find an Isolated Music and Effects Track. This provides exactly what it describes, as it eliminates dialogue from the mix. Extras like this don’t do much for me, but I always think more options is a good thing, so I’m happy the Blu-ray includes it. Three featurettes follow. The Ultimate Romance: The Making of Notorious goes for 28 minutes, 22 seconds and provides comments from Casper, filmmaker Peter Bogdanovich, Hitchcock’s America co-editor Jonathan Freedman, novelist/film historian Raymond Benson, film historians Bruce Scivally and Rudy Behlmer, author/film historian Collin Stutz, Hitchcock and Selznick author Leonard Leff, film critic Richard Schickel, Hitchcock at Work author Bill Krohn, cinematographer Nance Jordan, film professor Jonathan Kuntz, Alfred Hitchcock and the Making of Psycho author Stephen Rebello, It’s Only a Movie: Alfred Hitchcock: A Personal Biography author Charlotte Chandler, author/film professor Tom Schatz, and The Hitchcock Romance author Lesley Brill. “Romance” looks at the film’s development, story and character areas, notes about screenwriter Ben Hecht, cast and performances, various cinematic techniques, alternate endings and a few other topics. The featurette creates a good overview of the appropriate subjects and does so in an engaging manner. Alfred Hitchcock: The Ultimate Spymaster lasts 13 minutes, 10 seconds and includes info from Bogdanovich, Rebello, Freedman, Behlmer, Stutz, Benson, Scivally, Kuntz, Casper, James Bond, The Legacy co-author John Cork and film historian Scott McIsaac. “Ultimate” looks at Hitchcock’s take on the spy genre, with an emphasis on elements of Notorious. It’s another solid investigation of the subject matter; the ways the show ties the film to the Bond franchise seems particularly intriguing. Finally, The American Film Institute Award: The Key to Hitchcock occupies three minutes, 20 seconds. We hear from Hitchcock’s granddaughter Mary Stone as she discusses her grampa’s speech at the 1980 AFI. Charlotte Chandler also chats about Ingrid Bergman’s intro to Hitchcock. Their comments are fine, but the best shots come from the ceremony itself. Next we get a 1948 Radio Play version of Notorious. It runs 59 minutes, 35 seconds and brings Ingrid Bergman back to play Alicia; Joseph Cotten takes on the Devlin role. This one gives the tale a totally different opening – we meet Devlin before we encounter Alicia – and plays in a more narrative-oriented manner. It’s reasonably interesting, and I actually think Cotten fits the Devlin part better than Grant did. Two Audio Interviews with Alfred Hitchcock come next. We get one with Peter Bogdanovich (2:14) and another with Francois Truffaut (16:22). Both allow us to hear from Hitchcock himself and get a slew of good notes about Notorious. In addition to the film’s trailer, we find a Restoration Comparison. It fills two minutes, 50 seconds and shows fixes made for the transfer. It’s not particularly interesting. Many seem to regard Notorious as one of Hitchcock’s all-time great films, but I must admit I don’t get its appeal. While it has its moments, I think it’s too slow and lacks enough intrigue to qualify as better than average. The Blu-ray provides erratic but acceptable picture and audio along with a strong package of extras. Maybe someday I’ll warm up to Notorious and join its legions of fans, but today, it largely leaves me cold.